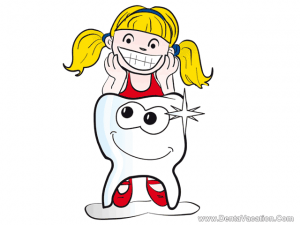 Children are prone to accidents, and many-a-times they tend to lose their teeth as they fall or suffer just some sort of a blow to their faces. While, in grown ups, dental implants are the most preferred treatment of choice for missing teeth, their use in children in questionable. Implants are mostly used in cases where the individual has completed his craniofacial growth. Implants in children or adolescents are usually not recommended as they may have several unfavorable effects including trauma to tooth germs, tooth eruption disorders and restrictions of skeletal craniofacial growth. If a dental implant is placed before the child’s jaw has reached its complete growth, it may hamper with the growth process. The implants are directly screwed into the bone, so they do not move easily. So, besides impeding the bone growth, implants placed in very young patients may also affect their natural teeth. Natural teeth, which have a living, functioning periodontal ligament, are known to move throughout life. And their movement is maximum during the growth years, when the teeth are trying to come into their natural positions. The interference of implants with these tooth movements may have considerable adverse effects on the individual’s natural teeth. Ideally, implant treatments must be deferred till the time the patient has completed his bone growth. By the age of 17 years in boys and 14-15 years in girls, most of the growth is believed to have completed, though variation may be noted in different individuals. It is for the dentist to decide if the patient, at his young age, makes the right candidate for receiving implants. However, implant treatments in children are not completely contraindicated. Studies have shown them to be useful in few rare cases, where the young patients congenitally suffer from severe hypodontia (less number of teeth) or anodontia (total absence of teeth), caused by syndromes such as ectodermal dysplasia. There are several instances, where dentists have managed to successfully place implants in young children, who had absolutely no teeth due to some congenital condition. It must be noted that implant surgery in children is restricted to a limited few cases; it must not be considered routine treatment. But, since looking good is especially critical for pre-teens and teens, and youngsters would never like to walk around with missing teeth, there has to be some solution for them, if they happen to accidentally lose some tooth. Affordable dental treatments abroad could be considered by parents especially from the US as procedures like dental implants in India and Zimmer teeth implants in Thailand are cheaper and one could save up to 30 to 50% on a procedure outside US. Everybody wants their children to be happily healthy and so the best option is considered by all. But not all can shell out too much money and some follow strict budgets. Dental tourism supports such people to achieve dental goals at surprisingly cheaper costs, usually unheard of in first world nations like the US and the UK. Lastly, until the child is old enough to receive an implant, the dentist can make a prosthetic restoration to restore the missing tooth temporarily. And eventually, when it is endured the jaw bone will not grow any further, the patient can be given a permanent solution in the form of an implant.